Double moss stitch is one of my favourite stitches, it is basically an extension of a standard moss stitch. The stitch produces great, stretchy fabric that does not curl around the edges making it ideal to use on edgings, button and button-hole bands as a background to a cable work or cosy scarves. Double moss stitch, just like a standard moss stitch, is made by alternating knit and purl stitches, but the difference is you work it over two rows. It is very easy to confuse the stitches and start producing rib stitches, so let me take you step by step through knitting the perfect double moss stitch. 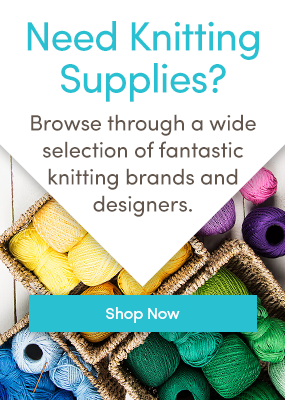 You will need some yarn and knitting needles suitable for your yarn – I’m using Cascade 220 and 4.50 mm needles. We will work this swatch over 20 sts, but you can work a double moss stitch over any even number of stitches. Row 1(RS): [K1, P1] 10 times. You can clearly see the V of a knit stitches and the bumps of purl stitches. The stitches are now doubled. If we were to continue to repeat last two rows we would end up with a 1 x 1 rib, but we want double moss stitch, so what we have to do now, is alternate our stitches, and basically work the opposite of the stitch that is facing you: if it is a knit stitch, work a purl, if it is a purl you will work a knit stitch. Row 3(RS): [P1, K1] 10 times. Row 4: as row 3, to double our row. You can now see very clearly how the stitches are alternating and rows doubling. Continue repeating rows 1 to 4 to the desired length. Double moss stitch also works wonderfully well as a motif on a background of stocking stitch. Try this heart swatch which is worked from the chart below! Starting on the RS and row 1, work 28 rows of the chart then cast off. The chart is a flat chart so it is read from right to left on a right side and left to right on a wrong side. Top tip! Make a fragrance draw pouch by joining your two swatches together around edges, leaving small opening, fill with lavender and sew up opening. Last updated: November 24th, 2016. Thank you so much. I have been knitting for years. However, there are times I’ve had to take a long break. I love the fact that I can be reminded how to do some stitches that I haven’t used lately.